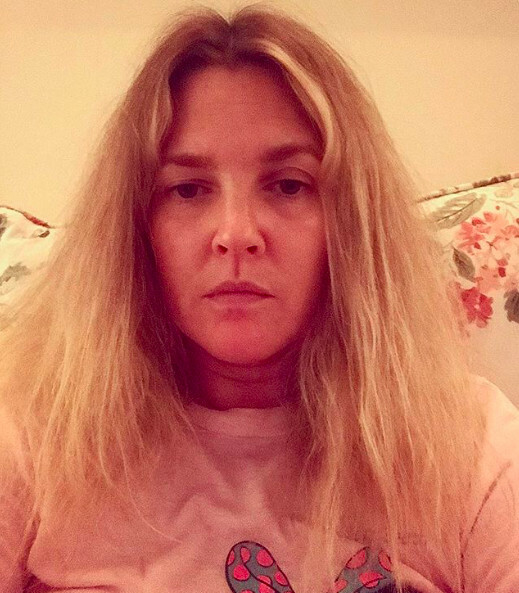 Barrymore wrote, "THE BEFORE ... OK when you get older, bleach is hard on the hair! I wanted to lighten up! But what happened was my hair just didn’t respond well this time. A few months ago I lightened my hair and it just looked dead! I am was sad. Don’t i look sad? This picture is sad! I wanted to do something to feel more attractive to myself and it totally backfired. Sometimes when you try to improve yourself and your confidence, it can go wrong, and then you feel worse. Haven’t we all had a haircut or a bad eyebrow tweeze or bad hair color and you just want to run home and get in your time machine and have a do over..."